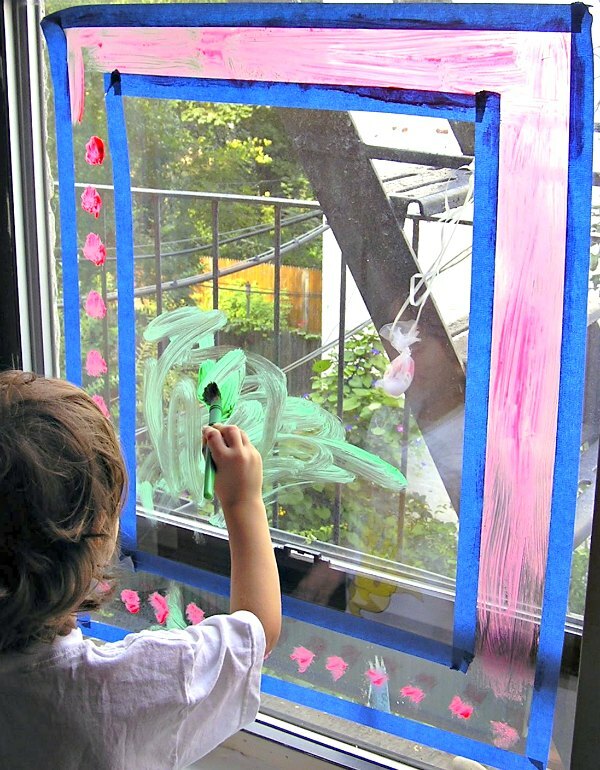 Would you let your kids paint on the windows? 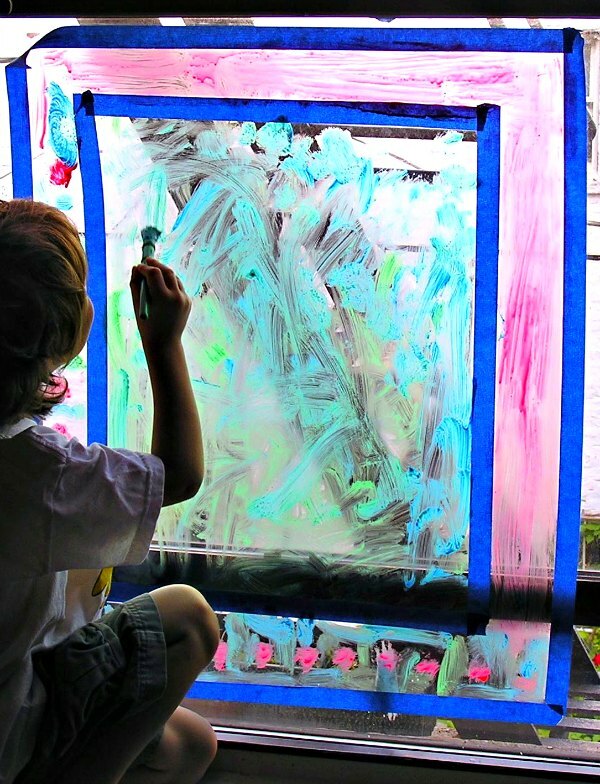 We love decorating our windows and so I thought, “why not just paint directly on the glass?” It’s a fun rainy day activity for the kids. It makes a nice change of pace from paper. Plus the kids feel like maybe they are doing something a bit unorthodox. They love that! I mixed a small amount of dishwasher liquid in tempera paint and let Kiddo loose on the windows. I used some painter’s tape to create a frame border for him to work in and around. The effect was nice when I peeled it off. You could even use the tape to create a Mondrian window! I love doing this when it is the weather is less than perfect. What a nice way to experience stormy, tempestuous weather — making art. Also, it’s good for disguising dirty windows. A few days later you can turn this into a window washing project or create a stained glass window using cellophane! For more rainy day ideas visit our Giant List of Indoor Activities for Kids. I love how you taped it off to keep the painter some natural boundaries. I can't wait to try with my little guy! I agree with Heidi, the tape boundaries are a great idea. I agree with commenter above, very smart of you to tape off the “no painting” areas. We use the window markers, but wondering if making some paint would be a little more interesting. omg….. the big orange splot was my FAVORITE BOOK as a kid. love it love it. that's why i was so mad when we couldn't have rainbow doors!!! Is it difficult to clean up?? Not at all. I used washable paint and it came off with water and a little soap. I did this with my 4-year-old today and she LOVED it. Thank you! Yay! I’m so glad it was a hit! Our 10 and 6 year olds love to draw on windows too. We use stabilo 3 in 1 woody pencils which can easily be washed off with water. You can also tidy up unwanted bits with damp kitchen towel. Great idea with using tape for masking off bits, going to try that nex time.